If you’re looking to buy the best folding saw this year, you should first stop to consider exactly what you want to use it for. There’s a wide range of very good folding saws available, from pruning saws, to Laplander and general survival folding saws that are great for camping and buschcraft. 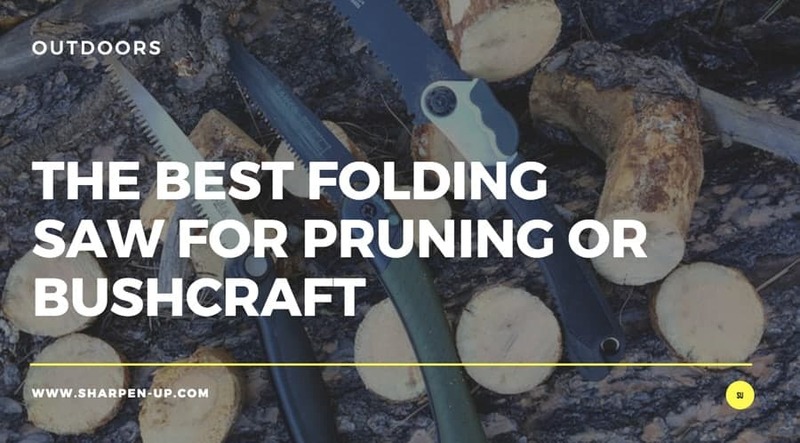 Because of this we have gone against the grain with this article and broken up our review table and sections into two – The best folding saw for pruning and landscaping, followed by the best folding saw for camping and survival. 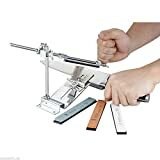 And if the in depth reviews don’t help you in your decision making, we’ve also covered the kind of things you should consider when buying one of these convenient tools. As a keen gardener, your pruning saw will be an integral part of your tool kit. 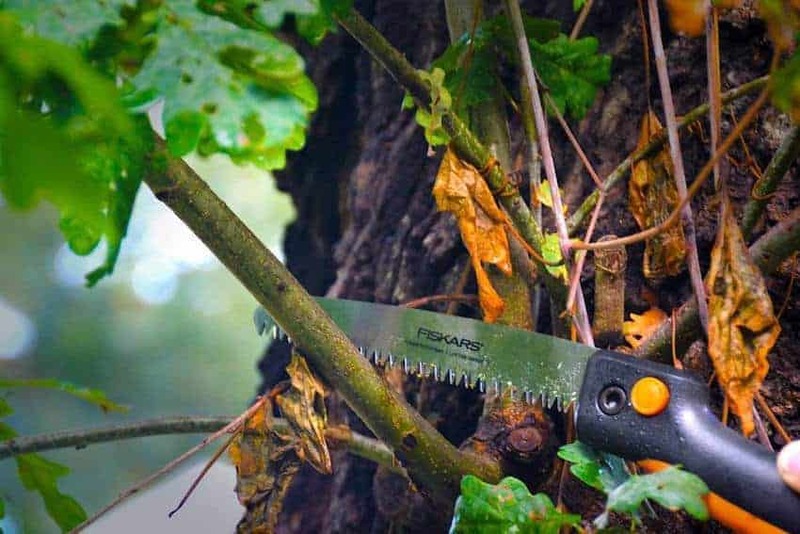 The fact you have found this page means you on the lookout for something a little more compact than a fixed blade pruning saw. The safety and convenience of a folding hand saw is a big plus. It can be tucked neatly against the body when not in use, and the sharp edges are kept away from other surfaces such as your flesh or the skin and bark of the plants and tree. 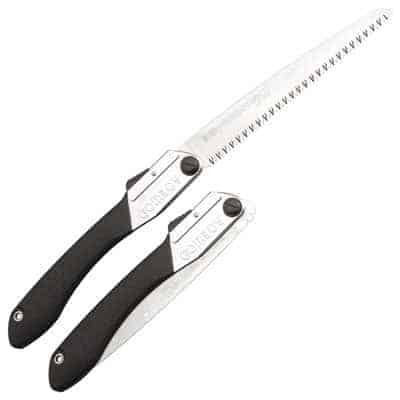 Your pruning saw will generally be used to cut through branches from between 1/2 inch wide up to about 5 inches. Anything larger and you will want a chainsaw to do the work for you. The great convenience of the folding pruning saw is the fact you are able to get into tight working areas with relative ease. 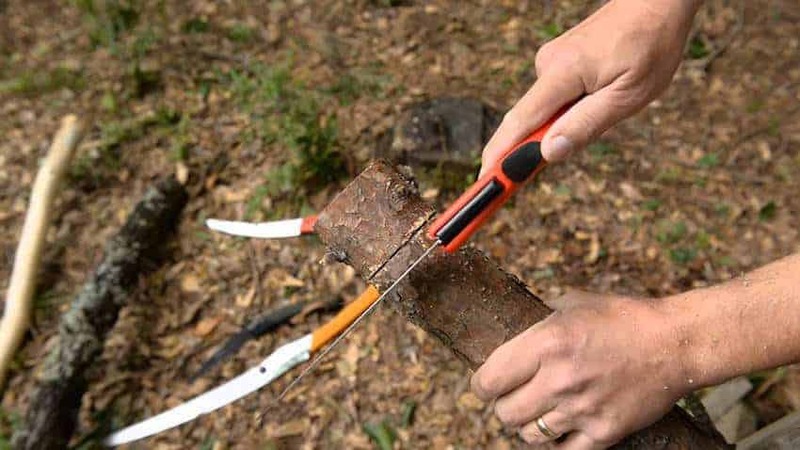 When working within the matrix of a tree or shrub you will be able to saw in narrow gaps to remove a branch without damaging the others around it. When buying a folding pruning saw , it is important to think of the types of branches you aim to be cutting. The saws are designed with either a curved or a straight blade, and the common consensus is that curved blades are better for smaller branches while straight blades make easier work of thicker branches. The type of work you will be doing means it is important to consider user comfort. This generally comes from buying a tool that is well-balanced and has a superior designed handle that is easy to grip. It is important to consider the size of your hand in accordance with the size of the saw. 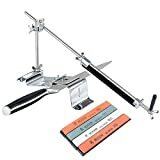 When buying online, where you will not necessarily have had the chance to hold the saw for yourself, search around for user opinion. Previous buyers will often comment if a saw is uncomfortable to use. The problem of left-handedness is common when it comes to garden hand tools. Folding saws can be susceptible to this due to the fact many will have an operable lock. Depending on the design, the operation of this may be inconvenient for left-handed uses. A control fitted on the top of the saw is generally the best option as this should be convenient for all operators. You should also consider the fact that you may be wearing garden gloves when using the folding saw. Comfort and overall grip may be impaired as a result, although thin rubber gloves can mitigate any issues. Those familiar with the Silky brand will be aware of the superior quality of their products. That same high quality fit and finish can be seen in this folding landscaping handsaw. The company have opted for a 9 ½ inch blade here, with a 8.5 teeth per inch (10 teeth per 30 mm) teeth configuration. 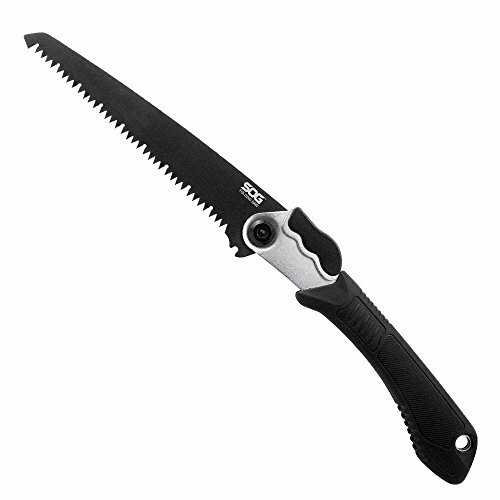 This provides an ultra smooth cutting action, specifically designed for pruning and landscaping. This is just one of the reasons the Silky is currently a bestseller among gardeners, earning a reputation as one of the best folding saws on the market today. So what else makes it the folding handsaw to buy? One of the reasons behind the high performing blade teeth, (believe us when we say this tool cuts with amazing speed, making short work of both green and dry wood), is that Silky have used their own proprietary MIRAI-ME (Smooth Cutting) Technology on the Gomboy. The blades are made from alloy steel that’s produced exclusively for Silky. Furthermore, this patented alloy is impulse hardened to create a harder, longer lasting cutting point. These are easily replaced too, via a simple screw in blade mount. As you would hope and expect from a top rated tool, the Gomboy is extremely comfortable to use. The textured rubber-padded handle feels great for both right and left handed users, and the reliable spring-loaded blade lock makes it very easy to operate. Another really good feature is the fact the Gomboy blade locks at 2 angles depending on your preference and workspace. This makes the Silky an excellent folding pruning saw, as detailed work and the ability to move and work in tight spaces is made much easier. For convenient storage the Silky comes with a clear plastic hinged carry case. The blade doesn’t lock in the closed position, meaning you can’t just throw this in the bag and expect everything to stay fixed. While the reviews consistently praise the strength of the blade, and our review model passed all cutting tests, some users have experienced a flaw in blade longevity with the saw tip snapping after only minor use. Apart from a minority of users that have experienced fault in blade strength, the Silky Gomboy is universally accepted as one of the best folding saws you can buy. For pruning and landscaping work, it really is the top of the tree (excuse the pun). Our number 1 pick for a reason, you will not be disappointed. 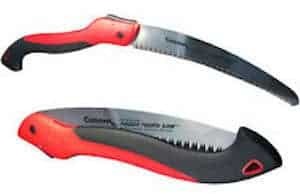 The Corona folding pruning saw is another bestseller that ticks many of the boxes when it comes to buying a quality folding saw for the garden. The blade is extremely sharp and the curved shape is well designed for efficient cutting. Although the saw only cuts on the pull action, (which helps prevent undue blade damage and friction), the curve shape does make it easier track the cut from base to tip. The manufacturers also boast that each tooth on the blade is individually whetstone-ground and sharpened at 3 angles. This increases the performance, making the tool extremely effective on all types of wood; from green to hard, or even dead and frozen limbs. The handle has a nice and comfortable contoured shape using hard plastic where it meets the palm of your hand and a durable polymer plastic grip for your fingers to wrap around. Even after extended pruning blisters will not be a problem. The handle is big too, so users with large hands or using gloves will still be able to use the tool with ease. Furthermore, the blade release is on the back of the handle so you can easily press it with either hand. A few users have complained that the nut holding the hinge mechanism in place can frequently loosen. Loctite has been mentioned as a quick way to solve the problem. The tool does not come with a sheath or case. There is only one locking position for sawing, (where as the Silky has 2). An affordable, ultra sharp folding pruning saw that gets the job done. This is a no nonsense affair and if the minor flaws do not put you off, it is very much a worthwhile purchase. Highly recommended. 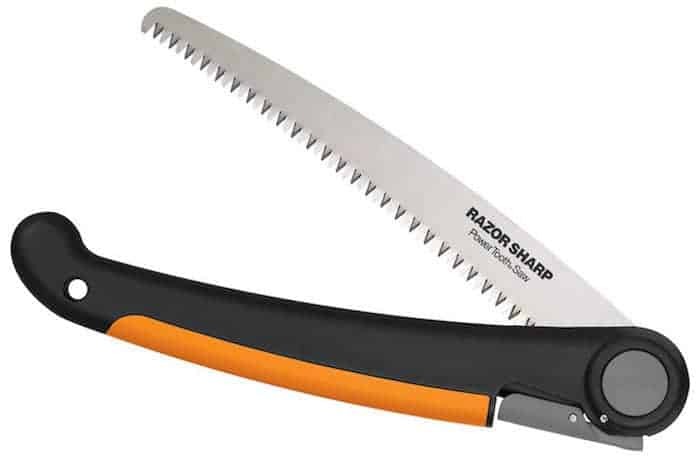 At the time of writing, the Fiskars folding pruning saw is the lowest cost option in our best folding saw list. It also features the shortest blade with a length of 7 inches. However, this does not stop the Fiskars from performing well and being a good pruning folder for those on a budget. 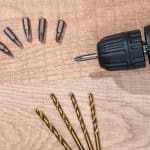 The company have utilised a patented PowerTooth blade manufacturing process, and beyond the marketing buzzword there’s no denying that the triple ground teeth do make short work of most wood types the average gardener is likely to come across. The non-slip grip handle does exactly what you would expect and is sufficiently comfortable to hold. The hinge and lock mechanism are also well built and will give you the confidence that the tool will last you a few years, despite the budget price. Overall, the compact design makes the tool easy to stash in your belt or pocket, making this a great go to pruning tool for home gardeners and professional alike. Some users have experienced the handle actually snapping after aggressive use. A low budget, yet sharp and comfortable folding pruning saw. 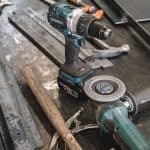 There have been some issues with the overall build quality for a small minority of owners, however to a degree this should be expected with such a low priced tool. If your budget is limited then the Fiskars is worth a look. 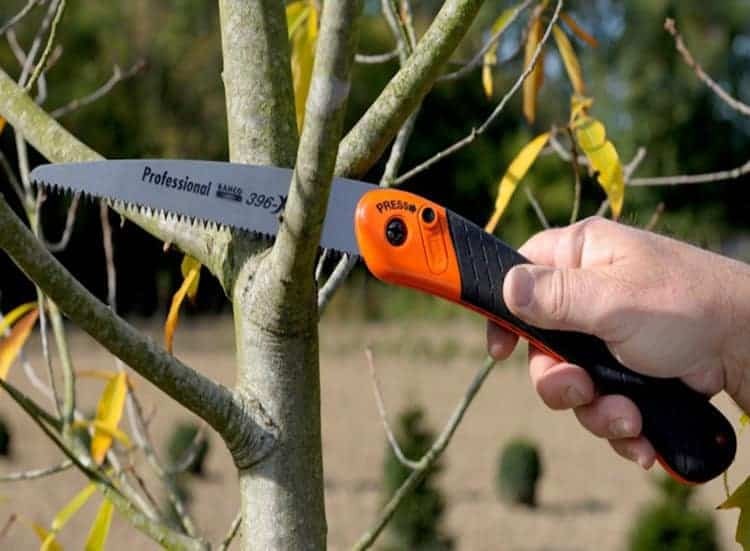 Many of the variables involved when choosing the best folding pruning saw, apply here too. When buying a folding saw for camping, survival or bushcraft you will want a tool that is light, reliable and highly portable. To a certain degree, build quality is even more important. You need a saw that can withstand the abuses of being out in the field, and thrown around in the kit bag. Comfort is clearly important, and again you will want a saw that is well balanced with a superior designed handle. The fact you will likely be using the saw in wet and slippery conditions at times, means a good strong grip is paramount. 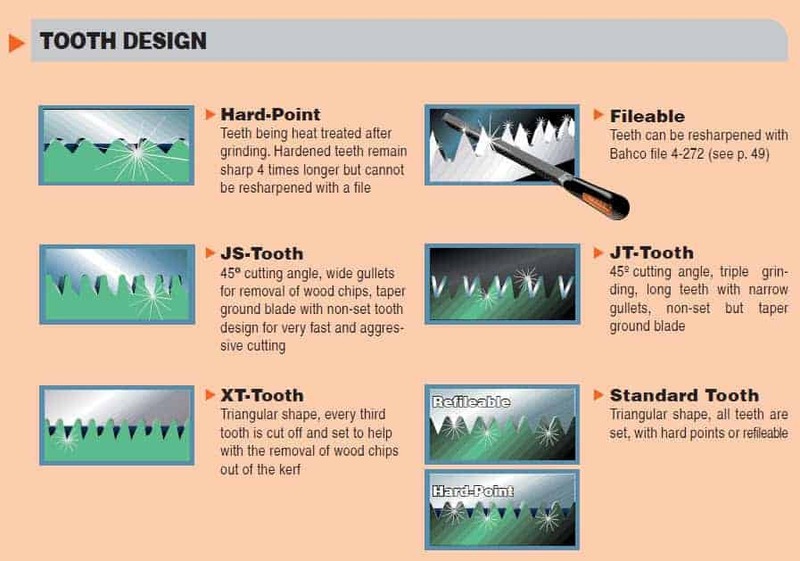 Blade and tooth selection are an important consideration when buying a camping saw. Because you may be miles from anywhere, and very dependent on the quality of your blade you will want your folding saw to perform well every time. Sharp and reliable edge retention, (that comes from quality blade materials) is a must. If possible, consider the type of wood you will be working on. It is generally accepted that the harder and drier the wood, the finer the teeth needed to produce a smooth working cut and stroke. It is often best to purchase a tool that is as versatile as possible. 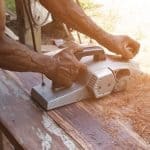 Many survival experts recommend a medium-toothed saw (8-9 teeth per inch), because it fits so many applications well – i.e perfect for the outdoorsman. For survival and camping, shelter materials will often consist of softer willow/cottonwood type trees. These can be tackled with a large toothed blade. However, if you live in an area where hardwood is prominent, a fine toothed saw may be the best folding saw for you. Finally, the size of the blade will impact performance. Coarser teeth on a longer blade will work well because of the leverage and stroke that the length provides. When using a smaller the blade, the teeth need to be finer in order to produce a smooth stroke on very dry or hard woods. 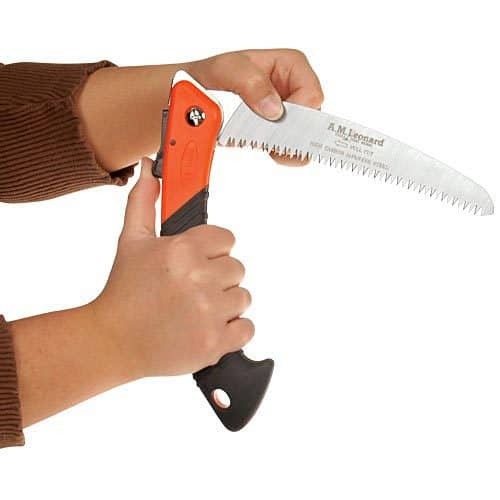 Overall, folding camping saws with medium teeth blades are the top recommendation for survivalist and outdoorsman. The Bahco Laplander folding saw is a clear winner in the market, and we have no hesitation declaring this tool our number 1 pick. The Laplander is perfect for bushcraft and survival use. It is everything you want such a tool to be and then some – tough, reliable, light and compact, and quick and easy to use. It is also extremely affordable. The Bahco Laplander Folding Saw comes in at only 9 inches (23 cm) long when folded and weighs just 6.67 ounces (190 grams). The guys over ay Bahco state that through the entire design stages of the tool, they had the true outdoorsman in mind. An excellent feature on the Bahco is the unique XT toothing. 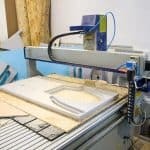 This has been developed as a fine and extremely sharp manufacturing design that enables ultra fast and efficient cutting. Blade quality and strength ticks all the right boxes too. Heavy gauge stainless steel has been used on the saw, giving the tool stability and superior anti-corrosive properties. The teeth have also been hardened for extra durability, while the anti-rust coating helps reduce friction. The blade folds and locks inside the handle in a way that is very satisfying indeed. Everything is so snug and well made, you will be using this folding saw for many years to come. For this particular review we have broken down the main selling points of the Bahco to give you as in depth an appraisal of the saw as possible. 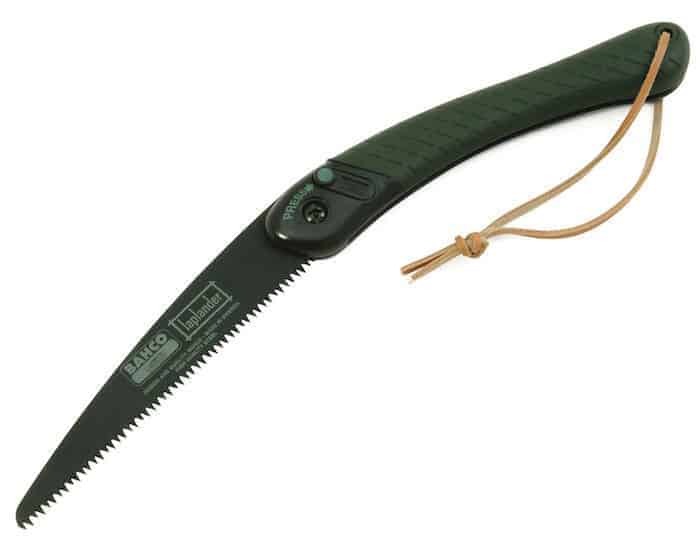 Being a folding saw designed for the outdoorsman, the Laplander is capable of cutting through a range of materials, including plastic and bone. On our tests, as well consistent user reviews, the Bahco folding saw made short work of both. The XT toothing is big factor in this. The blade actually cuts in both directions. So both pushing and pulling will see you work though the material you are cutting. Furthermore, the blade coating and design ensures that it very rarely sticks. Efficiency is the name of the game here. The ratio of work put in to results is actually quite extraordinary. 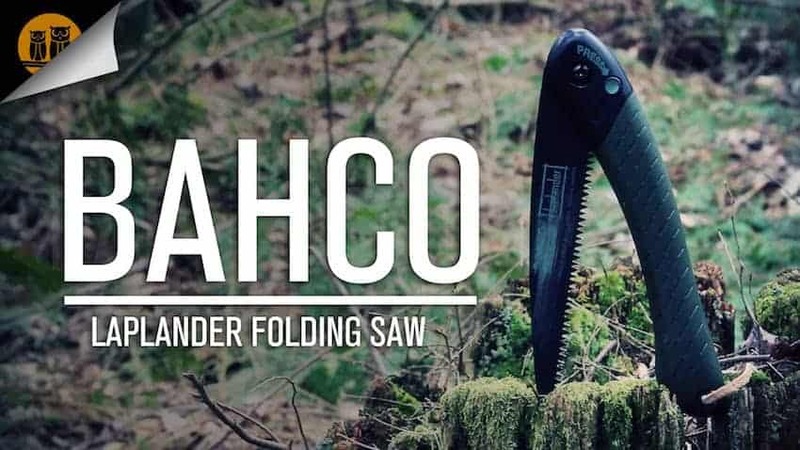 As we have already covered, the build quality is exceptional on the Bahco folding saw. Although the tool is light, it still feels solidly built. The way everything folds into place is extremely well made too. The handle is comfortable and designed to accommodate both large and smaller hands. The material used is shatterproof and high-density plastic. In short, the Laplander can take a beating and still keep on rolling. 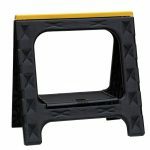 For wet conditions, the rubber coating provides a good grip and is comfortable during extended use too. A belt and wrist leather lanyard are supplied for carrying the Bahco folding Laplander saw. These are in keeping with the rest of the tool in being well made and pleasing to use. They really do add an extra level of convenience and are yet another reason this folding saw stands head and shoulders above the competition. The fact the blade teeth are hardened on the Bahco folding saw means they cannot be sharpened with normal tools. However, the blades on the Bahco can be replaced when the time comes. This is by far the best option when it comes to maintaining your tool. Fortunately the process is very easy to do. Just loosen a screw, pull out the blade, replace with the new one and screw back in. The Bahco folding Laplander saw really is the best on the market right now. From build quality, to efficiency and ease of use it cannot be beaten. If you are in the market for an affordable folding saw for survival, camping and bushcraft you need look no further than this. It could be that you are after a folding saw that is more of a general purpose tool. Suitable for a bit of backyard pruning, while at the same time can join you into the woods for some bushcraft. If that is the case, the Eversaw 8 inch folding hand saw may well be the tool for you. It may not have the finesse of the Bahco offerings reviewed here, but it doesn’t stop the Eversaw from being a really good option. First off the durable carbon steel blade really is up to the job. The triple-cut, medium razor teeth have been hardened for longevity and provide ultra smooth and sharp sawing. The saw features a 9 TPI (teeth per inch) design making it an excellent utility saw. Multipurpose really is the go here. Again, multiple tests with the Eversaw folding hand saw, prove that the tool can cut through wood, bone and plastic with consistent ease. The overall size is good, with the extended full length coming in at 17″ (closed length is 9½”). This gives the tool a nice sized handle that is both comfortable and good for both left and right-handed uses. The lock in blade is very easy to operate and is designed to so that no inadvertent collapsing will occur while work is in progress. For maintenance, an adjustable bolt can be loosened to release the blade when it comes time to renew. To top it all off, the Eversaw folding hand saw comes with a complete lifetime warranty. That’s how confident the company is about the quality of their product. Excellent multipurpose tool that works equally as well in the garden or out in the field. The blade, although strong and sharp is designed to flex slightly – if you try to saw larger branches with the tool you may find yourself snapping the blade. Not good when out in the field and the saw is the only one in your pack. 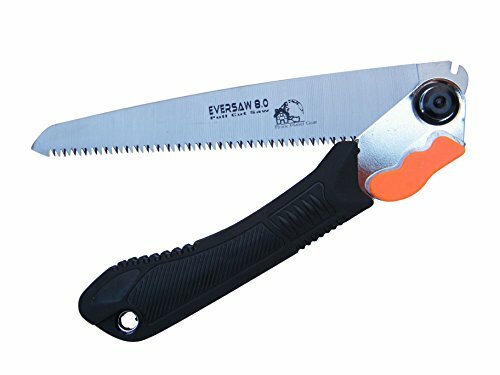 As an all rounder the Eversaw 8 inch is a fantastic folding hand saw. It really will get the job done in a full range of conditions. However, if you know that all you want to be doing is bushcraft and survival work, the Bahco Laplander is still the folding saw to go for. The SOG folding saw is a rather handsome beast. The Compact tool has been designed with camping, backpacking and hiking in mind and stands up to the tests well. The 8.25-inch high carbon steel blade with a black powder coat finish is one of the reasons the SOG looks so good. This attention to detail and black finish extends to the handle, which is also made from high carbon steel. As we say, the tool looks very sleek indeed. But what about performance? Overall there are few complaints. (Hence the SOG making our top 3 list). 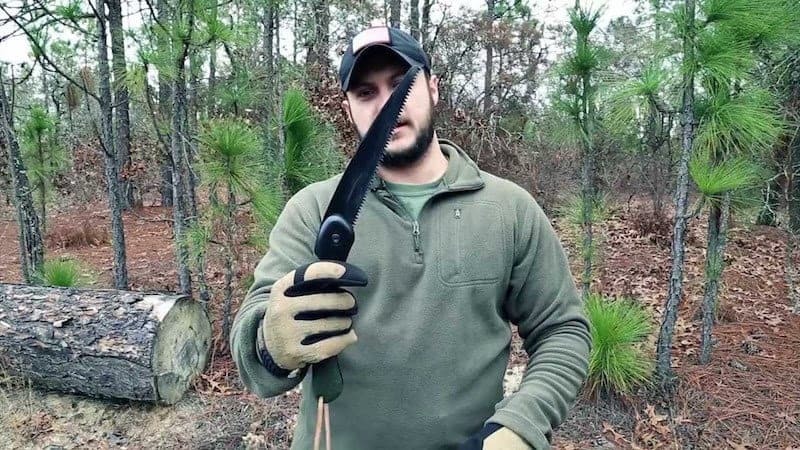 The tempered steel teeth work on hardwood and green wood, and the average sized blade makes this a great tool for out in the field. Keeping with that black theme, the company also provides a well made black sheath that features a snap closure and belt loop attachment for easy mounting and storage. When compared to the excellent Bahco, the SOG just doesn’t make the mark. The SOG folding saw is good looking tool but doesn’t quite get everything right to be the must have folding saw for the outdoorsman. The Bahco gets that distinction. Should you buy the SOG it will probably perform well enough for you. However, some of the lacklustre elements about this tool make it far from an essential purchase. You’ve read through our top 5 lists and our buyers guide, and now you know what foldable pruning saw you should buy. However, some of you may be new to the uses of the pruning saw and before you part with your hard earned money, would like to know a little bit more about garden pruning and how to go about it. That’s where the sharpen-up short guide to pruning comes in. Taking it back to basics, pruning is an important part of plant maintenance. It involves the selective removal of specific plant parts, in order for the plant to grow more healthily. Many parts of the plant can be pruned. Shoots and branches are the normal choice by gardeners, however roots, flower buds, and fruits can be pruned too. When you prune a plant, the damaged areas will quickly be covered by callus tissue to seal the wound. There are also chemical reactions that take place inside the plant. Chemical boundaries occur over the wound, walling it off from other areas of the plant. 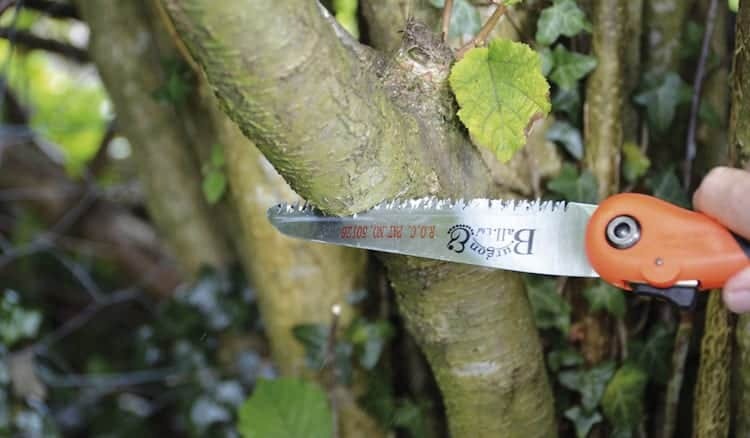 As you will see in the how to prune section further on, it is important to use pruning techniques that minimize plant wounding, and help endorse the correct sealing form. So Why Prune in the first place? From an aesthetic perspective, pruning can control the size of the plant so it better fits the landscape of your garden. Practically speaking it can also prevent roots from getting to large and cause issue, or the tops of trees interfering with lines or rooftops. Very often fruit trees and flowers need to be pruned in order to promote earlier and more vibrant vegetative growth. It can also help to grow larger fruits as the resources of the plant are concentrated in specific areas. 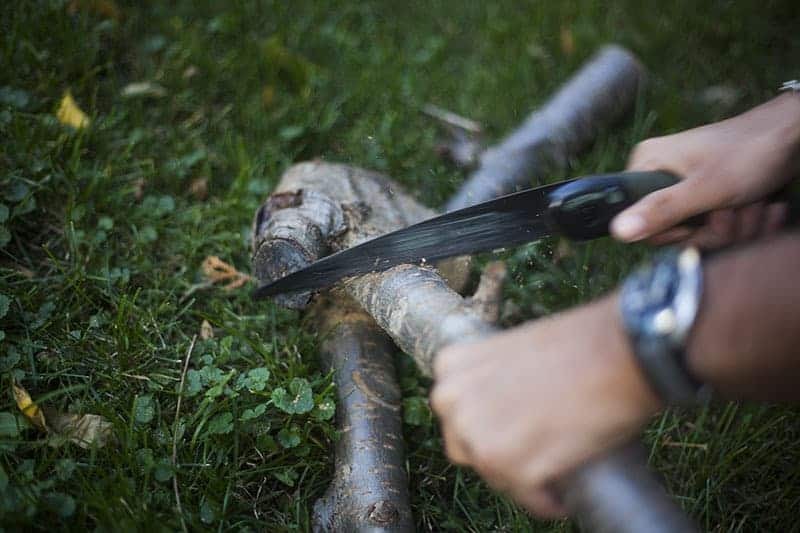 Similar to the impact that pruning has on vegetation, cutting back young plants makes it easier to control their growth patterns, and gives you a tool with which to successfully landscape your plants. Finally, correct pruning can restore health and growth into old plants that may be struggling. 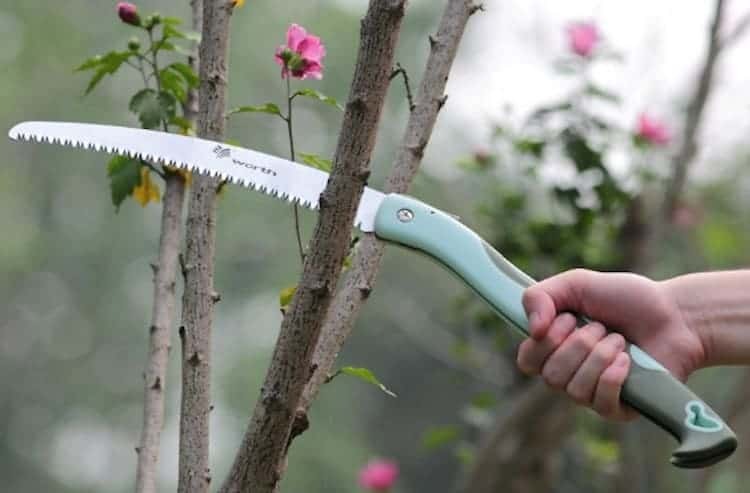 Now you know the importance of pruning, and we have given you the information above to buy the best pruning saw for your needs, it is time to get out into the garden. Ensure your safety is the number one priority (especially a s a newbie). You should wear work gloves and safety goggles if you are reaching into particularly thick foliage. Where the correct clothing too, shorts and t-shirt are a bad idea if you’re pruning rose bushes for instance. The beauty of a foldable saw is that you can get into tight work areas. This means you should be fully aware of what you want to cut before you begin. Pruning saws can very easily slip and damage areas of the plants that you did not intent. Take your time, to select the correct areas. By taking your time, you should be able to assume a comfortable position in order to cut precisely and at the correct angle. If you are stretching to prune a hard to reach spot, stand back and adjust your position accordingly; even if this means stopping to fetch a short stool or ladder. Awkward pruning leads to unsatisfactory work or possible injury. Beginner pruners will very often go straight to the point where the branch meets the main trunk of the plant. You cut here, and the branch is too heavy you may well have an accident on your hands as the branch falls on your head. Furthermore, the resulting split will tear the plant causing lots of undue damage. Prune back areas of heavy branches first, and then prune the branch off completely. That way you keep in control and your plant stays intact. Okay, so we’ve covered safety procedures and other tips, however exactly how do you go about making the cut? First you should make a starting groove. These saw action creates the angle at which you will continue to cut. Work inside this groove as you saw, ensuring that your strokes are slow and steady. The cut actually happens on the pull stroke, so ensure this is done carefully and with precision. Keeping sawing until the branch comes cleanly away from the plant. If a splinter or rough woo remains, use the saw to carefully shave it away, with a light stroke of your blade pressed flat against the area you have pruned. And there you have it, all the information you need to get out in the yard and start pruning. Have fun and happy gardening.